This is the last of the series on Erich Fromm’s The Art of Loving. The previous posts have outlined the importance of developing discipline and concentration. According to Wikipedia, patience is the ability to endure waiting, delay, or provocation without becoming annoyed or upset, or to persevere calmly when faced with difficulties. All leaders recognize how important this can be when faced with the inevitable challenges, frustrations, and problems embedded in leading others. In our world measured in nanoseconds, and when it seems to take forever (10 seconds) to get our cell phone on after pressing the start button, our patience is continually being tested.. It may take a lifetime to become the leader you are capable of becoming. The mastery of leadership is not achieved by doing a quick Internet search of leadership, reading two blog posts, and attending a motivational seminar. We must commit to our practice the same way all artists do who strive to achieve mastery of their craft. A leader who patiently practices the art of loving will transform leadership competencies into proficiencies and muddlement into mastery. Waiting is hard sometimes. You’ll need to restrain any tendency to jump to conclusions or rush into a decision. You will be tempted to get a jump on events or set things in motion early, so you can transfer your focus elsewhere. …Use the time to plan, consider alternatives, and have second, or third, or fourth thoughts. Above all, keep waiting and watching events, so you can shift direction if they change. …Slowing down and looking ahead may seem tentative compared with the methods of the Action Man School of Management. You will sometimes be criticized for being too slow and cautious. You may face laughter and ridicule. You shouldn’t care. Getting it right matters more. When the high-speed, short-term, grab and go manager has crashed and burned, you’ll still be in one piece, able to show the results that he or she frittered away. 1. Click here to read the following sections from an informative article on developing patience at Tools for Personal Growth. Determine 1 or 2 ideas you can take action on to improve your patience. What are some negative consequences of impatience? How do people respond to impatience in others? How do you feel when you are impatient? What are some beliefs of people who lack patience? 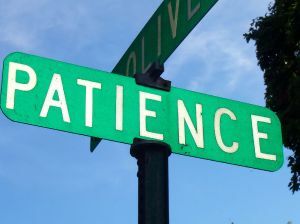 What new behavioral traits are needed for patience to develop in your life? Steps to develop patience in the pursuit of personal growth and change? 2. Click here to read and reflect on this collection of quotations on patience. Choose one quotation and place it by your desk as a reminder to keep focusing on patience. 3. Click here to read Joan Borysenko’s thoughtful article, Practice Patience. When you feel rushed and hurried be patient with yourself and the people you lead. I once heard patience defined as impatience stretched to its limit. The implication was that most people have no idea what patience really is. In the name of patience, we often hold back like a pit bull straining against its leash. We are not present at all just trying to look pleasant while our blood boils. Inside, we’re wishing that the traffic would clear, that our child would go to bed, or that our colleague would shut up already. A lot of energy is used up in the name of this false patience. 4. Read, reflect, and take action on the perspectives, suggestions, and creative diagrams offered at Slow Leadership. Find your genuine patience by practicing The Art of Loving in leadership. Thank you Erich Fromm for your legacy on love and leadership given to us 50 years ago in 1956. Your perspective and practices are timeless. Please note: I will be away on holidays during August. Have a wonderful summer. Until my regular posts return in late August I encourage you to read the interesting blogs listed in the right hand column. I was googling patience and leadership because I just fnished reading The 21 indispensable qualities of a leader; patience, apparently, isn’t one of them. I find your site refreshing. I don’t know if I want to be a leader without patience.